This page is the continuation of reference in support of Section 2c. American College of Radiology. American College of Radiology Breast Imaging Reporting and Data System BI-RADS, 5th ed, D’Orsi CJ, Sickles EA, Mendelson EB, Morris EA, et al. (Eds), American Colege of Radiology, Reston, VA 2013. 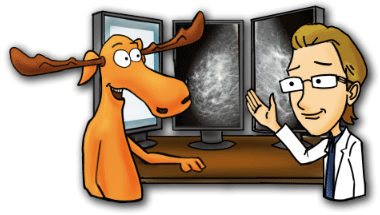 Breast Imaging Reporting and Data System (BI-RADS) Atlas, 4th ed, American College of Radiology, Reston, VA 2003. Bushberg, J.T., Seibert, J.A., Leidholdt, E.M. Jr., Boone, J.M. The Essential Physics of Medical Imaging, 2nd, Lippincott Williams & Wilkins, Philadelphia 2002. Stomper PC. Breast imaging. In: Atlas of Breast Cancer, Hayes DF (Ed), Mosby, Philadelphia 2000. p.54. The Most Common Appearances of Breast Cancer on Mammography.